Windows 10 save every thing. The password you use to log in to your online accounts are also saved. 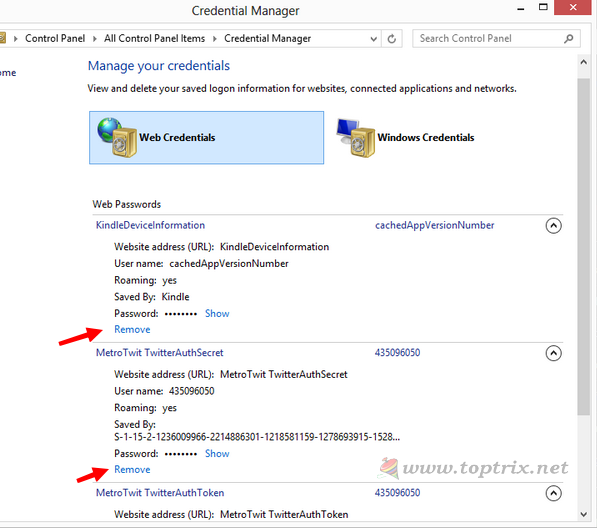 When you use Microsoft store modern apps like Twitter and facebook for accessing those services, your login information is saved to Windows credential manager. You can easily delete it if want to. Go to Control Panel in Windows 8 >> Settings >> Control Panel >> All Control Panel Items >> Credential Manager. You will find the list of all installed application where you enter user information.